I watched the video. Was amazed, but I think I'll prefer to write down the poem. Lol. I love the poems, but i especially liked the tanka. I liked the idea of respite from fate. If we could only do that, take a break from the inevitable. thanks for sharing these lovely water poems. I agree. At least if you write it down, the reader has half a chance of enjoying the poem for its own sake without being distracted by the question of "how is it done." Cool video, but I liked your poems the best. My favourite were the haiga, each so perfectly matched to the image. Thanks for sharing. I'm glad you like the haiga. I love combining words and pictures. Appreciations for this float of a video, Diane! I feel children will love to get their hands wet with words - a way to lead them to poetry. And I could look at each haiga you've shared many times over..
Now here's a poetic line: "get their hands wet with words." Thanks, Jan. Enjoyed that video -- how interesting and hands on! 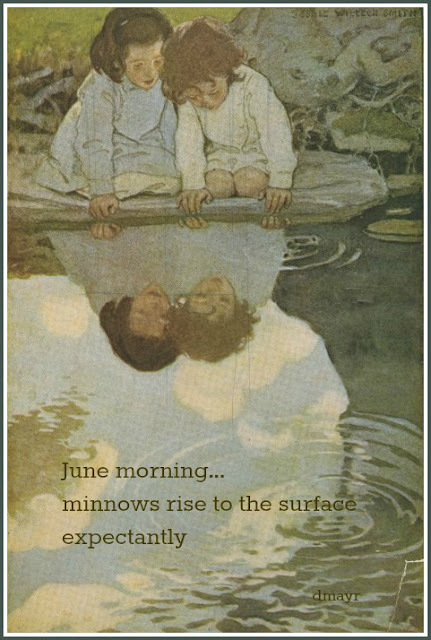 I think my favorite is the minnow poem...I like how the minnows' expectancy is reflected (literally and figuratively) on the children's faces. And it's such a sweet old illustration by Jessie Willcox Smith. 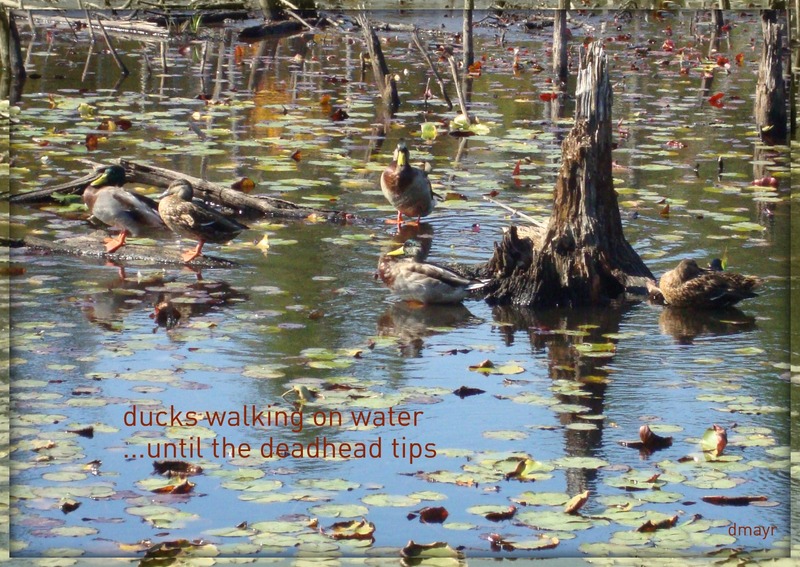 What an amazing water-poem roundup within the PF roundup! A post-Thanksgiving feast for ears and eyes. I loved your question-posings about the plastic words. (I could spend a lifetime posing/pondering without necessarily testing out...).. 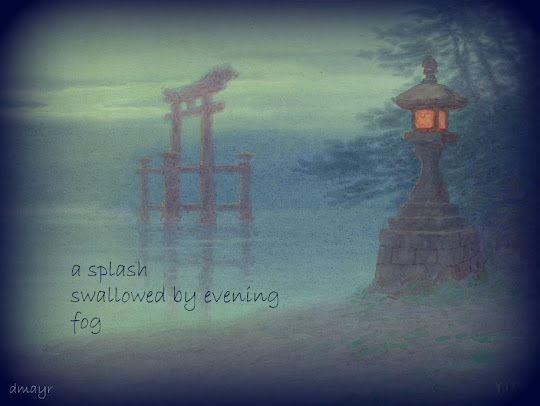 I especially was captivated by the first haiga photo and the aural-oral image of "a splash swallowed by evening fog." Thank you! God bless you for all your generous sharing. You're right about the pondering--it's much easier than the testing! All lovely, Diane. I like the 'splash swallowed' very much. Fog brings so much to the imagination, and it's rare here. As for the video, I have seen others use some different apps to make the words move/appear. Interesting effect. Some day I'd like to try a video. I'm not there yet, though. Very cool! I'd just as soon not know how they did it—I like the magic. You have a touch of the magic too, Diane. My favorites are vernal pond, a splash, and June morning. I think vernal pond is my favorite, too! Those screens are wild--what a cool new way to show this poem. I also like all of your watery poems. 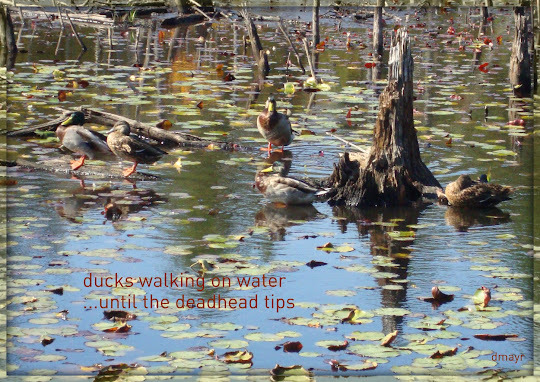 I wrote a watering hole poem in response to a 15 word-or-less photo--maybe that was where yours started too. I just looked it up, and I wrote the poem on March 3, 2011. Laura only has "15 words" poems back to April 2012, but March 3, 2011 was definitely a Thursday. Love all your watery poems. I think my favorite is the fog haiga. Art and science combined, too! Wow! Thanks for sharing, Diane. Fascinating stuff. Love splashing around in all these offerings today, especially your "vernal pond." Thanks, Robyn! I enjoy finding a topic and searching through my old stuff to see if I can find anything applicable. I did love the sound of water while reading the poems. Your evening fog poem was lovely - I think I rather prefer the still image, and the chance to just focus on the words. I think that's the torii gate at Mya Jima. It's the only one in water. I've been there and walked that path to view it from the side. But it was about a hundred degrees - no fog. Today at the MFA I saw woodblock prints by some of Hosukai's students. I read about kyoka poems- light-hearted poems using a 5 line meter like waka poetry. Do you know these forms? Must research! Hmm...I thought the video was just enough tech for a haiku. The shadows in the water made me think too much about how they were doing it and not enough about the haiku (or the frog or the water).